The National Gallery of Jamaica wishes to update all our audiences that there will be some changes to the NGJ’s Jamaica Biennial exhibition. Moving forward, we shall be dividing the Biennial into two separate exhibitions. Both will occur every two years, on alternate years. The first exhibition will be held every two years in the Summer and will be similar in structure to the current Jamaica Biennial. It will be called The National Gallery Summer Exhibition. As the name suggests, the first staging of this exhibition will be in Summer 2019. This exhibition will be curated by either one Curator or a small group of Curators selected from a local and an international pool of professionals with knowledge of contemporary Caribbean Artistic developments. The Curator[s] will select the artists to be involved as well as possible themes for the exhibition and work with the artists to develop a cohesive exhibition. This exhibition will be staged in multiple locations in Kingston to form part of a city-wide art and culture experience. Artists from Jamaica as well as the Jamaican and Caribbean Diaspora will be considered for this exhibition. The first Kingston Biennial is scheduled to open in December 2020. If there are any questions, please contact the National Gallery of Jamaica. The Jamaica Biennial 2014 is scheduled to close on Sunday, March 15, and to mark the occasion the National Gallery of Jamaica will exceptionally be open from 11 am to 4 pm on that day. A special programme of Artists’ Talks will be presented on that day, starting at 1:30 pm. Admission to the National Gallery of Jamaica and the Artists’ Talks will be free but contributions to our donations box are much appreciated and help to fund exhibitions and programmes such as the Biennial and our Sunday programming. The Jamaica Biennial 2014 has been a landmark exhibition in several respects and has received significant critical acclaim, in the media and from visitors. Rebranded from what used to be the National Biennial, the Jamaica Biennial 2014 was re-conceptualized to have a more international outlook and to engage local and international audiences more effectively. It is the first Biennial to be judged by international curators – Sara Hermann from the Dominican Republic and Diana Nawi from the Perez Art museum in Miami. It is also the first to include non-Jamaican artists, Blue Curry (Bahamas), James Cooper (Bermuda), Gilles Elie-dit-Cosaque (Martinique), Sheena Rose (Barbados), Richard Mark Rawlins (Trinidad), who were invited to participate in the Special Projects section of the exhibition, along with the Jamaican-born Renee Cox. In another first, the Biennial is shown at more than one location: in addition to the main exhibition at the National Gallery itself, this includes Devon House, which features work by Greg Bailey, James Cooper, Laura Facey, Ebony G. Patterson, Oneika Russell, and Cosmo Whyte, and National Gallery West in Montego Bay, which features work from the Sacred Geometry series by Renee Cox. One special project, PARADISE.jpg by Blue Curry, consists of an intervention on the facades of several buildings in Downtown Kingston. 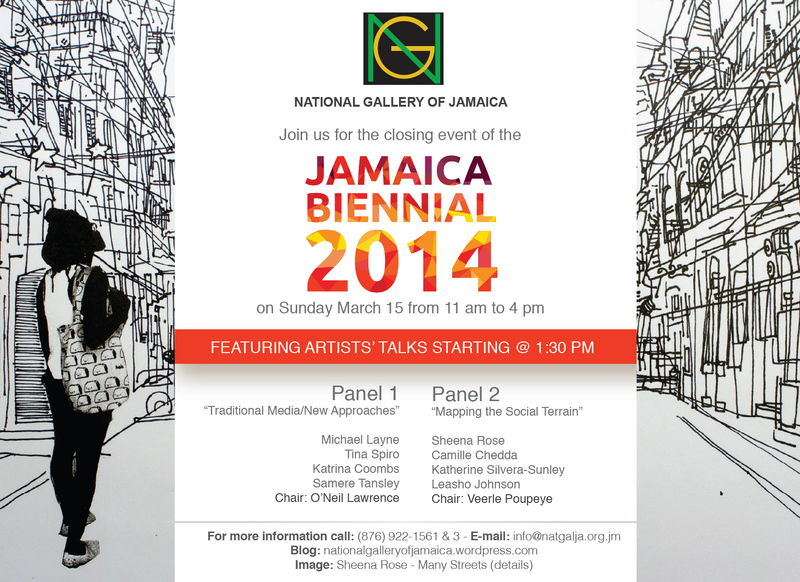 Sunday, March 15, represents the last opportunity to see the Jamaica Biennial 2014 in its entirety.